We were on the way to Hector’s for coffee and whatever sweet things they may serve when we walked past Patisserie Madeleine and I stopped. They sell macaroons. 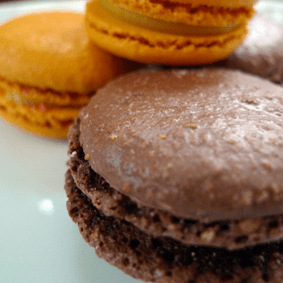 French macaroons, those nutty, gentle, chewy and crispy little dainties, sandwiched together with ganache or flavoured cream. My favorite thing in the world. This is where we had to go for cake. So we did. Patisserie Madeleine is tiny. The decor is coldly formal, cleanly black and white, and the service smiling and efficient. The coffee is good and the cakes sumptuous. But there was something fuzzy about the whole experience. My coffee came with frothy warm milk in an elegant spoutless little jug, with a truly delightful mini chocolate Madeleine on the side. The raspberry macaroon concoction came glued to a pretty gold card with ganache, on nice white china, silvery cutlery and black napkins. There just seemed to be more bits and pieces than strictly necessary. The service and the crockery belong in an expensive hotel with a champagne bar, a formal space that can accommodate 150 people, not a tiny little cafe that sits 12 at a stretch. Yes, it felt correctly French, but it came across as pretentious rather than charming. Luckily, Patisserie Madeleine offers their goodies for take away, not just sit in. The dozen macaroons I took home with me were lovely. The variety was very exciting: not only macaroons but different flavours. Unsurprisingly, some flavours work better than others: the chocolate and pear was a wonderful surprise while the bright-orange mango macaroon looked more exotic than it was. Chocolate was as rich yet light, raspberry brightly pink but neutrally flavoured, vanilla delightfully silky, pistachio just the right kind of nutty. Patisserie Madeleine is not a place I’m likely to go to sit for a long leisurely coffee on a Sunday afternoon. It is, however, a place I will make pilgrimage to for the macaroons. They are great. Last updated by Caroline von Schmalensee at April 25, 2017 . Seafish Grants: How creative could we be? The link for ‘Madeleine Patisserie’ takes you to a New York shop called La Maison du Macaron – not very useful! Thank you for the prompt – I’ve changed it to the correct link. i love this place – tasty!